The 2018 Cash Game Festival Bratislava at Banco Casino Bratislava has been a massive success with records broken, including one for the casino with 11 cash games running simultaneously at peak times. This decimated the previous casino record of eight tables. 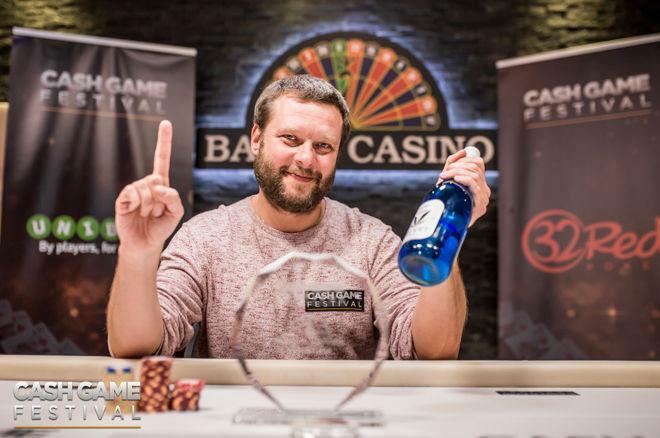 Cash Game Festival Co-Founder Martin "Franke" von Zweigbergk won the coveted trophy of the event by winning the most big blinds at any of the televised feature tables after he won €1,563 or 781.5 big blinds at a €2/€2 pot-limit Omaha table. "Get on your bike, Jon Kyte!" Von Zweigbergk had the trophy on his mind ever since the festival introduced the concept at the Cash Game Festival in September. He watched in envy as Jon Kyte (London - September), Kevin Malone (Ireland - October), Heiti Riisberg (November - Tallinn), and Gang Wang (January - London) all won the trophy he was after. For a while, it was looking like the trophy would wind up elsewhere once again. Russia's Vladimir Demidov headed into the final table with the lead in the trophy contest after he won €4,614 at a €5/€10 no-limit hold'em table (461.4 big blinds). However, von Zweigbergk appeared determined and shared with PokerNews before he was at the table that his heart was set on winning the trophy. Von Zweigbergk could have actually wrapped things up early as he was ahead more than €1,000 or 500 big blinds which would have also been good enough for the trophy. He decided to not only stay at the table, but play in high variance spots just as often as he was before. The crowd watching let out a loud cheer for Franke when he wrapped up the contest. Franke said his famous catchphrase to PokerNews: "I am the bestest!" He sent a small jab to his friend and the first-ever Cash Game Festival feature table winner Jon Kyte: "Get on your bike, Jon Kyte!" While Kyte did not win his second Cash Game Festival trophy, he did extend his own record for the most feature tables won at the festival. 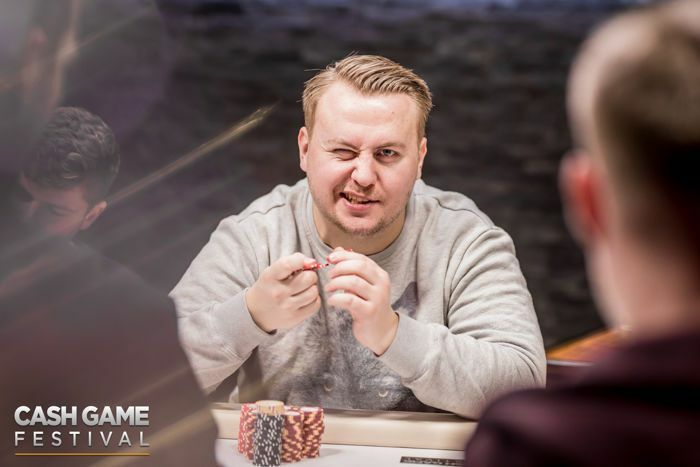 On Day 2, Kyte won €3,736 (373.6 big blinds) at a €10/€10 pot-limit Omaha feature table to be the biggest winner at a Cash Game Festival feature table for the sixth time. The feature table is just part of the draw of the Cash Game Festival. As is always the case, there were games available for everyone with players enjoying no-limit hold'em, pot-limit Omaha, pot-limit Omaha high/low, Sviten Special, super dealer's choice, and more at stakes low and high. The Cash Game Festival is also more than just about poker. Every festival features activities away from the tables where players with similar interests can bond. In addition, the festival collaborated with the MPN Poker Tour running one floor up from the casino which brought many people to the Cash Game Festival that don't normally expose themselves to ring games. Players that won packages to Bratislava, and those that purchased the hospitality package, were invited to enjoy themselves in organized activities with other poker players including welcome drinks, a VIP dinner, a players' party, a wine outing, and a guided tour of the Slovakian capital. If you were unable to make it out to Bratislava, rest assured you will not have to wait too long to enjoy the next festival. April 25-29, the Cash Game Festival heads back to where it all began to the majestic Estonian capital of Tallinn on April 25-29 at Olympic Park Casino for another five days of nonstop cash game action. The festival is expected to attract many players from around the globe, especially from the nearby Scandinavian and Baltic countries. Sweden's Peter La Terra, Ireland's Kevin Malone, and Slovakia's Alan Sabo are three of the players expected to attend as they each won Cash Game Festival packages, valued at €1,500, to the event after winning high hand raffles.